United Yacht Sales New Jersey would love to guide you through a personal showing of this 52' Harbour Yachts 2009. 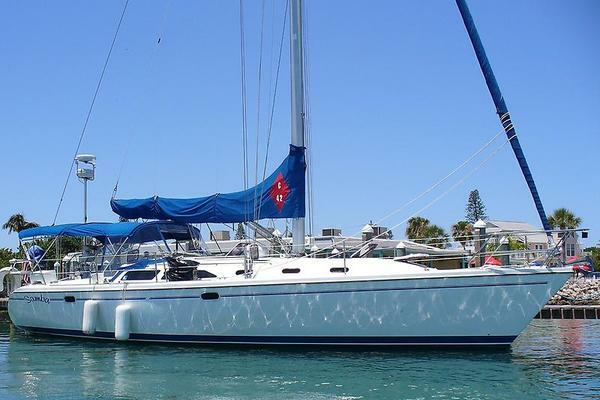 This yacht for sale is located in Auckland New Zealand and priced at $750,000. For a showing please contact us by filling out the form on this page and we will get back to you shortly! Large central double berth up forward. Further aft there's a bathroom to starboard and a separate shower stall to port.Next is a double berth cabin to port and one double berth to starboard. Step up to the saloon with nav station on port side forward and a large u shaped setee and table to stbd.A large galley, behind the nav station to port side and open to the saloon, Just aft and starboard of the saloon there's a double berth cabin with its own head and wash basin.All interior panels, doors, cabins, galley, bathroom and shower are painted with white semi gloss Polyurethane paint. Clear finished teak timber floor in saloon and cabins with rubber tiled floor in shower and bathroom.